August 16, 2015 by Anna F.
Luis Ventura – OrganoGold’s Persistent Millionaire! Luis Ventura and his wife Angela have seen it all through Organo Gold network marketing business. Each and every mlm top earners have their unique story to tell, but this one is simply breathtaking! Doing what you don’t like doing and turning out to be the best in it, is quite ironical in every measure! Luis and Angela Ventura were, at first, never even interested in Organo Gold multi-level marketing business from the word go. I normally smile, when I remember how Luis Ventura initially said no, not once, but four times to his friend’s request to join Organo Gold! I cannot help but wonder how many people have said no to their possible future time and financial breakthroughs, just like Luis Ventura initially did! Luis and Angela are currently a symbol of success not only in Organo Gold mlm, but also in the entire multi-level marketing business. The family is in top 50 of mlm top earners of all times in the world, and is still going strong. 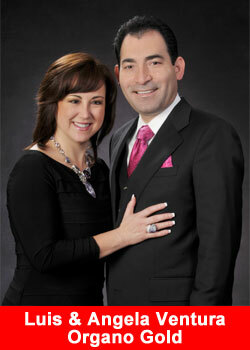 Luis and Angela Ventura are also very popular multi-millionaires in the world of multi-level marketing business. Luis Ventura and his wife, earn a passive income of over $200,000 per month, which adds up to approximately $2,400,000 per year. They are one of the most respected mlm millionaires in the world and one of the best motivational speakers and mentors in my opinion. Their family background and journey in Organo Gold mlm ventures will most definitely leave you breathless! Luis Ventura is not only a world renowned Organo Gold Multi-millionaire but also a loving husband and father. Luis is married to Angela Ventura and they have been blessed with two daughters. Most of the information about these multi-millionaires is kept very private and confidential. This is mostly in private policies of many multi-level marketing companies. For example, it is not very clear where this particular millionaire couple currently live. What is known for sure, is the fact that Luis and Angela Ventura are bilingual and fluent in English and Spanish. Another example of someone in the mlm world that doesn’t want their personal life to be publicized too much! The family has ancestral links to Colombia and Brazil. Various online publications quotes that the family currently lives in Miami, in the United States of America, but it is not a fact that they can prove. After all, they have all the money and time that can enable them live in any part of the world! Luis Ventura is a very down to earth millionaire. It is not easy to spot him among the crowd unless you hear his voice or see him in his flashy cars and private jets. Luis Ventura is very eloquent and dearly loves his wife, Angela Ventura. Luis Ventura is currently a very popular and highly adored mentor, and business motivational speaker. He is always on the move, receiving invitations and requests to feature in various Organo Gold and other mlm events worldwide. It is in fact very rare to find him idle, not because he is busy working, but just having fun while exploring the world and traveling. Luis Ventura and his wife Angela had a rather different experience in the Organo Gold Multi-level marketing business. Luis Ventura never wanted and never liked the idea of joining a Coffee business, as he was told early by his sponsor. Luis and Angela Ventura had a lot of financial stress, but never knew that there can be any better way to solve their problems. Luis Ventura had a 8am to 5 pm job in the real Estate industry, where he had worked for over 15 years. The inflation crisis of 2008, 2009, and partly 2010, badly affected their real Estate business, which eventually led to him losing his job. The cost of living had risen drastically as a result of inflation in the world, and there was not enough money available for customers to buy properties. This is because commercial banks had stopped giving their customers big loans to buy properties and cars. This is what led to drastic decline in the real estate business. Luis Ventura knew that he had to look for a different job, almost immediately, and he eventually did it in style! Luis Ventura got himself not one, but four full time and part time jobs. He was really committed to ensuring he meet all the needs of his family! Luis Ventura and his wife, Angela Ventura, could afford little cash to satisfy their immediate needs, with the four jobs Luis had. The family also hardly had time to be at home, share, and take care of their children. Angela Ventura was always on the look-out for an opportunity that would make her comfortable, other than giving her enough money and time with her husband and children. The family, therefore, joined several multi-level marketing companies, but they simply never felt comfortable with the compensation plans in those companies. Angela says that their pay outs were very little and tedious to achieve. They at first felt frustrated and decided to concentrate on their traditional jobs. Luis Ventura received a call from his close friend, Johnson who informed him that he has a business he wanted him to join. Luis Ventura however said no to this offer, because he was very busy with his 4 jobs and was not ready to add a fifth one. Johnson called again, again, again, and again; four times, to try and persuade him to join Organo Gold mlm business, but still got a negative answer. Luis turned down the Organo Gold business offer on grounds that he has never planted coffee and he had never been interested in selling coffee after all. My friend, Mr. Johnson is that type of a person that never takes no for an answer. And that is a great thing for Luis and Angela, for sure! Since he also knew how his friend was struggling financially, he decided to give him a presentation on the Organo Gold business model. Mr. Johnson therefore invited him to pay a visit to their sponsor who gave him a presentation on Organo Gold compensation plan and its business model. It was after that intriguing presentation that Luis Ventura at least knew what the Organo Gold Business entailed. He confesses that he regretted having said no to it early, but at the same time became grateful that his friend never lost hope in him. Luis Ventura went back home, discussed the Organo Gold opportunity with his wife and its Network marketing model and finally joined the business, after Angela fell in love with it. The Couple never knew that they have just entered a gold mine, and that was where they would experience massive success and fame! I think we should also give a try to anything that look viable in business! Luis Ventura and Angela Ventura’s other businesses were equally doing great when the couple joined Organo Gold. The main problem was that their businesses had a lot of customers but gave them barely enough money. Luis Ventura and Angela Ventura are currently one of the Organo Gold top earners. They have experienced some tremendous success within the shortest period of time, and arguably have the best success record in the history of Organo Gold multi-level marketing. Luis Ventura achieved Ruby in the first two months of joining Organo Gold, Emerald in their third month and by the fourth month, he was making more money in Organo Gold than he makes in the four of his businesses. It took the couple exactly eight months after resigning from their previous jobs to go Diamond, and approximately one year to achieve the Blue Diamond. It took Luis and Angela Ventura exactly 6 months to achieve the Black Diamond and another six Months to achieve the Crown Diamond award. 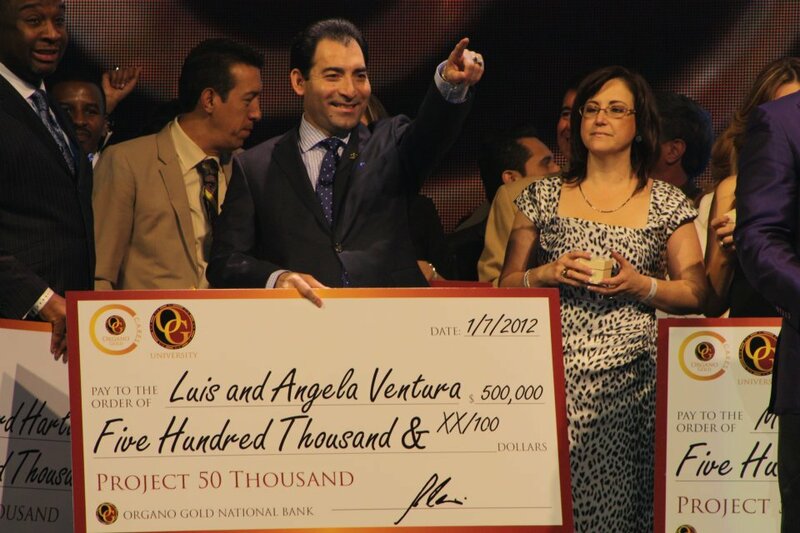 Luis and Angela Ventura took exactly 3 years to earn a cool million dollars in passive income and achieve one of the highest achievements in Organo Gold. When asked how even that was possible, Luis Ventura says it is out of hard work, determination and Persistence. Luis adds that Organo Gold mlm business is simple and easy. Luis and Angela Ventura are one of the richest and most successful family in the Organo Gold network marketing businesses. The family has not only been rated as having the fastest growing Organo Gold business organization, but also one of the best individual product distributors of all time in Organo Gold. As result, they have won and achieved a number of awards and accolades with their organization and themselves as individual Organo Gold product distributors within the shortest time possible in the history of Organo Gold Multi-level marketing business. Other than Luis Ventura and his wife, Angela, featuring in various millionaires’ magazine and interviews, Luis and Angela Ventura have achieved almost all awards that can possibly be achieved in Organo Gold network marketing business. in his Organo Gold mlm business career. The couple is also a millionaires Club member and one of the elite Club members in Organo Gold mlm Business. Luis and Angela Ventura is a multi-millionaire couple that is full of luck, if you ask me! Just imagine entering into a business you do not like and then emerging to be one of the most successful mlm top earners, within a very short period of time. How they did that is a topic of discussion for another day, but it is a fact that Luis Ventura and Angela are Organo Gold top Earners who are simply unique and simply the BEST in business! Would you continue to ask someone after they tell you ‘no’ multiple times? Or would you give up on the first no?